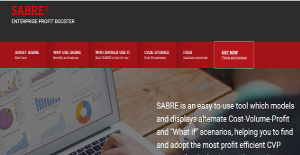 SABRE is an user-friendly managerial information utility that models and shows alternate Cost-Volume-Profit and “What if” scenarios, enabling you to adopt the best CVP strategy to boost your profits and grow your business. SABRE is far from its close competitors, being a profit-oriented and truly dynamic charting system that is a breeze to use. Regardless of the size of your business, geographic location, and present profit standing, SABRE’s dynamic break-even charting system is guaranteed to improve their profit performance. With SABRE, business owners, CEOs, and other profit accountable managers are empowered to analyze and evaluate alternative cost-volume-profit scenarios and choose the combination that shows the best probability to achieve the biggest profit boost. SABRE is quite an easy dynamic charting system to work with, being a plug and play application. It only requires the enterprise name, currency, financial year open and close dates and three values – annual sales revenue, fixed costs, and variable costs – to work its magic. Once you have filled the necessary fields with the required information, SABRE generates a display of break even charts that give you access to actionable management information. And the whole process only takes five minutes. The system brings tons of benefits to your organization’s profit performance. For one, it helps you realized improvement of profits by as much as 30% up to 80%. SABRE’s management information also gives you a clearer and bigger picture of your profit relationship to costs, providing you with a deeper understanding and insights that you can use to further bolster profitability. Do you want to see how your profits will be if other elements and figures come into play? SABRE lets you analyze and explore your other options and determine whether such a scenario will bring in more profits or not. Also, all the data (figures, charts, forecasts, and KPIs) can be exported to help you generate in-depth management and financial reports on a monthly basis. What Problems Will SABRE Solve? 1. Owners and managers often do not understand the relationships and interdependencies between costs, revenues, and profits. A common misunderstanding is that of price reduction and sales quantity, where a 1:1 relationship is assumed, whereas the rule of thumb is that a 10% price reduction requires a 50% (NOT 10%) increase in sales quantity simply to maintain the existing profit level. 2. Faced with a significant downturn in profit despite increased total revenue the client searched in vain for the cause, with the search confined to uncovering production inefficiencies and/or defalcation. The search was in vain. The true cause remedied immediately upon detection through CPV analysis was that there had been a massive shift in the sales mix with 80% of sales revenue coming from the lowest margin products in the range as compared with 20% in the prior year. 3. Chasing increased revenue in order to increase profit resulted is serious fatigue and dissatisfaction and high staff turnover among operating staff. The suggested remedy was to increase selling prices in order to suppress demand. CPV analysis showed that elasticity of demand would result in a slight decrease in demand and a significant increase in profit – a classic example of working smarter, not harder. If you are considering SABRE it may also be sensible to investigate other subcategories of Best Business Intelligence Software listed in our base of SaaS software reviews. Every company is different, and might call for a special Business Intelligence Software solution that will be designed for their company size, type of customers and staff and even specific industry they support. We advise you don't count on locating a perfect software that will work for every company regardless of their background is. It may be a good idea to read a few SABRE reviews first and even then you should remember what the solution is supposed to do for your company and your employees. Do you need a simple and intuitive solution with only basic features? Will you really use the advanced functionalities needed by pros and large enterprises? Are there any specific tools that are especially useful for the industry you work in? If you ask yourself these questions it will be much easier to locate a solid app that will match your budget. How Much Does SABRE Cost? We realize that when you make a decision to buy Business Intelligence Software it’s important not only to see how experts evaluate it in their reviews, but also to find out if the real people and companies that buy it are actually satisfied with the product. That’s why we’ve created our behavior-based Customer Satisfaction Algorithm™ that gathers customer reviews, comments and SABRE reviews across a wide range of social media sites. The data is then presented in an easy to digest form showing how many people had positive and negative experience with SABRE. With that information at hand you should be equipped to make an informed buying decision that you won’t regret. What are SABRE pricing details? What integrations are available for SABRE? SABRE integrates with every Accounting and ERP system in use. If you need more information about SABRE or you simply have a question let us know what you need and we’ll forward your request directly to the vendor.